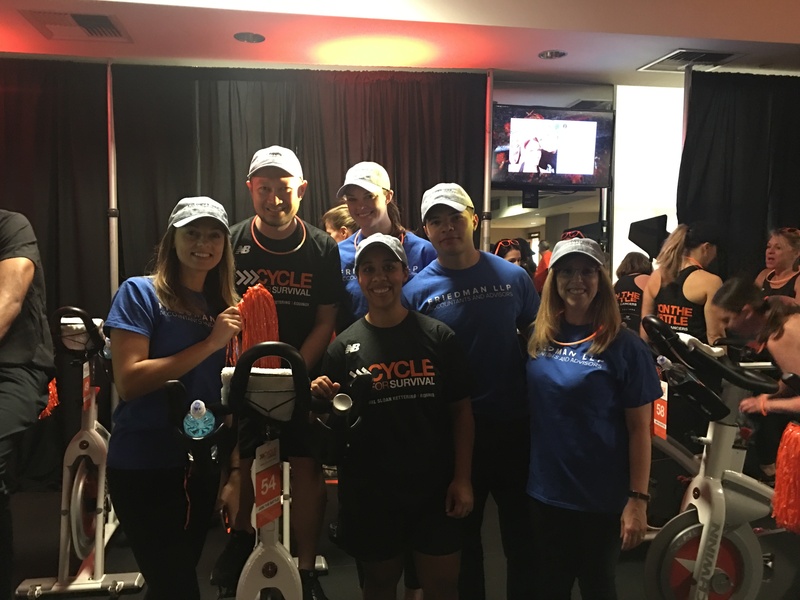 As part of Friedman's employee-inspired philanthropy initiative, Friedman Gives Back, a team of enthusiastic employees participated in this year's Equinox Cycle for Survival on Sunday, February 10. This impactful event is dedicated to raising money to fund research at Memorial Sloan Kettering Cancer Center for rare forms of cancer. Each team has a four hour shift to ride stationary bikes together to raise money and awareness. Friedman's team helped raise more than $2,000. Below is a snapshot of our dedicated employees during this exciting day when teams across the nation cycled for a cure. Friedman's team included: Lisa Busch, Oliver Dionisio, Aaron Gonzalez, Jill Jacobs, Kimberly Piscopo, David Schneyman, Jillian Wilson and Shamisa Zvoma.